It’s hot in NYC and I love it!!! When the weather gets hot and humid, you need to keep your makeup simple and long lasting. Here are a few of my favourite items that I think are important and can withstand the summer heat! You really should wear sunscreen everyday of the year, but during the summer months when the sun’s rays are at their strongest, you need something to protect your skin from premature aging and sun damage. Also, don’t forget to reapply often if you are going to be outdoors for long periods or perspiring. I switch between a regular moisturizer with SPF and a tinted moisturizer with SPF. Doesn’t matter what you use, just protect your skin!!! I love wearing bronzey, golden shimmery shadows and eyelids can get very slick due to increased oilness and sweat. A primer is a must!!!! Helps the product stay put and keeps colours vibrant. 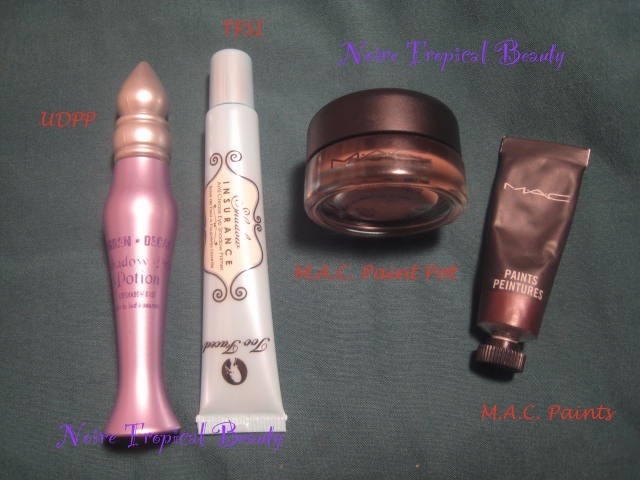 A few favourites are Urban Decay Primer Potion, Too Faced Shadow Insurance, M.A.C. Paint Pots. Doesn’t matter what you use, once it works for you. NYX makes a good drugstore alternative as well. The next primer that I am going to try is the NARS Smudge Proof Eyeshadow Base. I’ve heard great things about this! Water-resistant/waterproof gel eyeliner has a permanent place in my makeup bag. Easier to use than liquid liner and more durable than pencils, I have them in a variety of colours. Once they set, they don’t budge and they last all day and night. M.A.C. Fluidlines and Bobbi Brown Longwear Gel Eyeliner are cult classics but I am currently obssessed with Inglot‘s Gel liner in #77, which is pitch black!!! The texture is really smooth and amazing. Great for all skin types especially those with dry skin. Everyone makes a cream product, so just find one that suits your tastes. They don’t require tools (I apply with my fingers) and they blend amazingly into the skin. They are less likely to disappear the same way powder does. You could even add a powder blush over the cream to intensify the colour. A few to try are NARS The Multiple (comes in a variety of shades that bronzen, colour or highlight), BECCA Cheek Tint, Make Up For Ever HD Blush. I have been on a lipstick run for a few months now. Having neglected lipstick for years in favour of lipgloss, I have finally started adding to my stash again. This season is all about the bold, matte lip. Matte lipsticks are heavily pigmented hence have better staying power. Keep the rest of the face simple, let the lips speak for themselves. Currently obsessed with M.A.C. Ruby Woo, but Make Up For Ever, NARS and NYX also have popular mattes. What do you like wearing in the summer?? I am ready for the Fall! You know I can’t put the colour down!!!! It has been hot here too!!!!!! I’m getting more into matte lipsticks now!!! Look out for my review soon!